LAWRENCE, Kan. – A flurry of second-half 3-pointers helped the No. 13/14 Kansas Jayhawks fend off the Oklahoma State Cowboys, 84-72, Saturday afternoon inside Allen Fieldhouse. 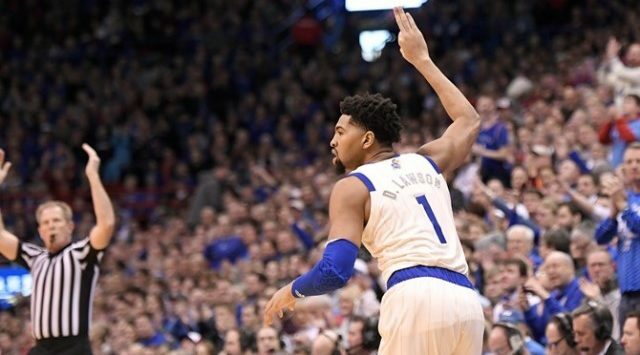 Redshirt-junior Dedric Lawson posted a game-high 25 points, 18 of which came in the second half, while freshman Ochai Agbaji connected on a career-high five 3-pointers to help the Jayhawks to their 17th-straight victory in Lawrence. The win moved Kansas to 18-6 on the year and 7-4 in the Big 12, while the Cowboys dropped to 9-14 and 2-8 in league play. With the game knotted up at 49-49 and 14:08 to play in regulation, Kansas was seemingly unable to land the knockout blow to a pesky Oklahoma State squad that continued to counter each Jayhawk run. But a group of KU freshmen erupted on a shooting exhibition that handed KU a lead that it would not relinquish. The tie score lasted for approximately 10 seconds as Devon Dotson sprinted down the floor and sliced to the rim for two of his 18 points to put the lead back in the hands of the Jayhawks. After OSU’s Cameron McGriff brought the Cowboys to within two points with 12:32 to play, 53-51, the Jayhawk shooters took over to help KU finally put some distance between themselves and the visitors. Freshmen guards Agbaji and Quentin Grimes hit two 3-pointers apiece on a 12-0 Kansas run to get the Jayhawk lead to double digits for the first time of the day, 65-51, midway through the second half. Lawson then took over the scoring load, as the Memphis, Tennessee native scored 10 of his team’s next 11 points in the next five minutes of game action. The All-American candidate swished a pair of 3-pointers during that run as the Jayhawk lead was pushed to its largest of the game, 76-58, with 5:00 to go in regulation. Dotson finsihed the day with four-straight free throws and a lay-up as the Jayhawks closed out the 84-72 win and moved to 14-0 at home this season. The Jayhawks had a tough time pulling away from the Cowboys over the first 20 minutes of action. Despite Agbaji hitting a trio of 3-pointers in the first frame, KU was unable to build a lead of more than six points throughout the half. It was a fast start for the Jayhawks, who sprinted out to a 7-2 lead behind a steal and dunk from Dotson and a 3-pointer from Lawson. Another quick 7-2 spurt two minutes later saw KU push its advantage to 14-8; however, OSU had an answer as a Lindy Waters’ triple ignited a 7-0 run that gave his team its first lead of the game, 15-14, with 12 minutes to play in the half. Kansas got its lead to five points, 33-28, with just over two minutes to play before the break, but an 8-3 Cowboy run to close the half knotted up the score at 36-36 as the two squads headed to the locker room. But the Jayhawks turned in six 3-pointers in the second half and outrebounded the Cowboys by a tally of 25-12 in the final 20 minutes to turn a halftime tie into a 12-point victory. Lawson hit the 20-point plateau for the 13th time this season, scoring 25 points on 10-of-17 shooting. He also added seven rebounds and five assists. Agbaji posted his second-career 20-point outing with 23 points and a season-best five 3-pointers. Dotson was the third Jayhawk in double-figures, posting 18 points for his third-straight game scoring in double-figures. Junior Mitch Lightfoot added a season-high nine rebounds and a pair of blocks in 20 minutes to along with his six points.